Prices include FREE shipping & insurance. A FEW THINGS from the back room, which I have never listed before. With the advent of eBAY, general computer ownership, and websites everywhere (not to mention a dramatically changing economy and customer profiles), my sales have become more individual, more digitized, more private. **SOLD** A previously unnoticed Hungarian edition of "Maria Ward's" Female Life Among the Mormons, published at Pest in 1858. NOT IN FLAKE, and a nice-looking curiosity! Click on the picture or the link above to go to the detailed illustrated description. NOT IN FLAKE, and now as scarce as Viagra was in 1882. Click on the picture or the link above to go to the detailed illustrated description. **SOLD** Not just anybody's kid! Do you recognize who this is? A rare and precious original photograph of Joseph and Emma's youngest child - artist, poet, missionary, and eventual tragic figure. Click on the picture or the link above to go to the detailed illustrated description. **SOLD** "Austin Ward's" Male Life Among the Mormons, published at Stockholm in 1857. What a great illustration! Flake locates only one other known example of this wrapper, designed to sell these lurid tales of polygamy to a Swedish audience at the time of the Utah War. Click on the picture or the link above to go to the detailed illustrated description. NOT IN FLAKE, and a nice copy. Click on the picture or the link above to go to the detailed illustrated description. The Mormons' Revenge A Swedish anti-Mormon cowboy story, nicely, er, um, badly illustrated. **SOLD** A Document signed by Jacob WHITMER less than two months before he gave his final deathbed testimony of the Book of Mormon. Also signed by one of the witnesses whose testimony sent Joseph Smith and others to the Liberty Jail. Click on the picture or the link above to go to the detailed illustrated description. **SOLD** An exceptional copy of Orsamus Turner's famed history of Phelps and Gorham's Purchase. The author knew Joseph Smith when both were young men in Palmyra, and historians often refer to this book. A nice example, owned by former "neighbors" of the Smiths, and then by local publisher/historians until 1940. Click on the picture or the link above to go to the detailed illustrated description. **SOLD** U.S. Army printed General Orders in the Utah War, 1857-8. Offered with related woodcut illustrations of the day. JOHNSTON APPOINTED to lead "Johnston's Army"; how to feed and organize the troops; avid praise for their conduct, ". . . not showing the inhabitants of Salt Lake Valley, . . . either by act, word, or gesture, that they had recently stood towards them in a hostile attitude." **SOLD** The rare Sangamo Journal. 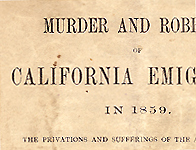 A political editorial issue, attacking Governor Ford for not arresting the culprits thought responsible for killing Joseph and Hyrum Smith. Why won't W. W. Phelps reveal to the people of Illinois what was in the secret letter he received from Governor Ford? Click on the picture or the link above to go to the detailed illustrated description. **SOLD** . . . THE NEW RAVEN. ADAM AND THE DEVIL. A freethought humorist takes sides with the Mormons over the Beecher-Tilton scandal. "Tickled all the Mormon people/ To their Polygamic core . . ."
NOT IN FLAKE, and pretty obscure! Click on the picture or the link above to go to the detailed illustrated description. **SOLD** Joseph Smith shows the papyrus, and points out the actual autograph signature of Abraham. He then explains that it is "unadvisedly . . . absurd" to teach that Christ will reign personally upon the earth during the Millennium! 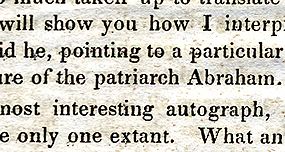 An important interview, printed in the Supplement to the Courant at Hartford, 1840. Click on the picture or the link above to go to the detailed illustrated description. 1837 Traveler's folding map of Illinois, published in Philadelphia by S. Augustus Mitchell. In stunning condition, never repaired! Nauvoo does not yet exist - or even Commerce or Carthage. But do you know the way to Venus? Click on the picture or the link above to go to the detailed illustrated description. **SOLD** How they celebrated the 24th of July in Salt Lake City during the gold rush, reported in a very early example from the first volume of the DESERET NEWS : the seventh issue ever published, during its first summer of operation, July 27, 1850. Offered on eBay March 5, 2005 (ten-day sale). Brigham Young personally entertains Stansbury, Gunnison, and Ben Holladay at this major event intended for Saints and gentiles alike! Click on the picture or the link above to go directly to the eBay listing with detailed illustrated description. **SOLD** MURDER AND ROBBERY . . . on the Sublette Cutoff, 1859. Annie Shepherd was already unnerved after seeing the Mountain Meadows children heading back to the East. Now her husband and friends are massacred: were all 25 attackers Indians? Who were the ones speaking such good English? NOT IN FLAKE; and not in ANYTHING - so far as I can find. Click on the picture or the link above to go to the detailed illustrated description.